Though some of the patents are standard security fare, a few involve depth-sensing technology, IAM noted on Monday. These include "Computer-vision based security system using a depth camera" and "Method and system for using light emission by a depth-sensing camera to capture video images under low-light conditions." The portfolio was purchased prior to December 2018, yet official word of the IP reassignment only recently appeared in the U.S. Patent and Trademark Office database in late February. In all, Apple acquired eight properties including U.S. Patent No. 9,396,400 for a "Computer-vision based security system using a depth camera," No. 9,965,612 for "Method and system for visual authentication" and No. 10,009,554 for "Method and system for using light emission by a depth-sensing camera to capture video images under low-light conditions." The company also purchased applications currently under review including Method and system for using light emission by a depth-sensing camera to capture video images under low-light conditions, two properties (1, 2) for a "Computer-vision based security system using a depth camera," Speech interface for vision-based monitoring system, Two-way communication interface for vision-based monitoring system and Method and system for incident sharing in a monitoring system. Former Lighthouse CEO Alexander Teichman is credited as an inventor on each patent and application. 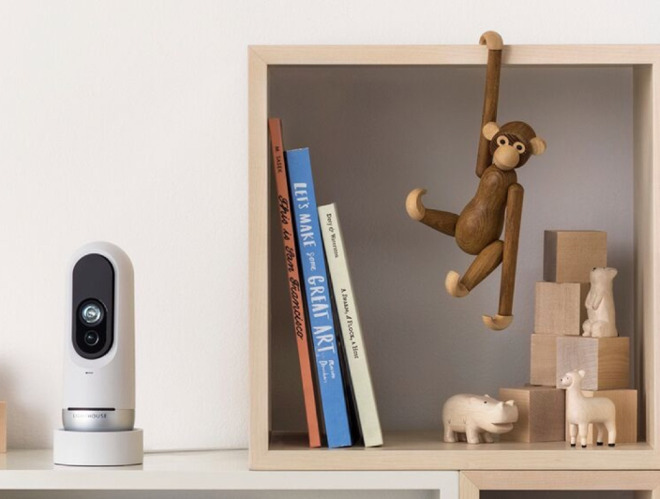 Lighthouse shut down towards the end of 2018 after its home security camera failed to perform in a market dominated by companies like Ring, Nest, Arlo and Wyze. The Lighthouse camera cost $299 and required a paid subscription to enable some AI features. It was, however, capable of 3D sensing and included a facial recognition subsystem to remember homeowners, family and frequent visitors. Depth sensing and facial recognition were indeed part of Lighthouse's draw, with the company offering push notification services that would alert users when certain people arrived home. The tech was also used to filter out security camera "noise" like shadows and pet movement to greatly reduce the number of false positives. Apple is not believed to be making a play for security camera market, though it could use the patents to deter lawsuits and bolster camera technology for iPhones, iPads and Macs. Apple has been rumored as working on a rear-facing 3D camera for 2020 iPhones, specifically using a laser sensor with 15-foot range. That might enable more possibilities in augmented reality. The company is also believed to be developing an AR headset, for which depth detection would be a vital component. That may ship in 2020 or 2021. Sadly I expect that Apple will be sued by a patent troll with a patent for "Using an Imaging Device to Image Things". They suit will go to trial, Apple will be found guilty and be ordered to pay $100 billion. Then after Apple wastes a million or more the judgement, and the patent, will be thrown out. The following month it will happen all over again. Lather Rinse Repeat. I hope this is a sign Apple is getting serious about home automation on the hardware side. Or is this something for their car "hobby"? The Camera, Security and Computer vision patents can have many applications in autonomous systems including self-driving cars. But then again, Apple may be gearing up to go into home automation. Apple recently hired Sam Jadallah, former CEO of smart lock company Otto, to head up its smart home initiatives. I'm not going to really worry about it or make a guess. Apple buys or puts of patents all the time that are never used. Maybe Apple will do something with this, or maybe they won't. It may be something in the future, buy why worry about it now. Now if they would only buy a cellphone provider, a cable/satellite provider!!!! Oh, and Tesla...so they can rewrite the code so it's not based on Android! The low light applications for depth cameras, applies to autonomous vehicles, iPhone, iPad, AR glasses, etc. Makes sense, wouldn’t want a patent troll buying that and using it against Apple. I also wish they would sell a rebadged "Dumb" tv from LG that can only be bought online and sell an apple sound-bar with HomePod like sound (+Siri) and AppleTV included, maybe a router and TimeCapsule all in one! Another example of why buying hardware that requires subscription to work is a bad idea. Company goes under and your gear is hobbled or useless. Especially true of startups and one-hit wonders. Just sell me something that works as advertised without a monetary umbilical. If it costs more, so be it. Smart reply. Also Apple never patents one thing for one reason. When they bought Primesense, people could only think of their past(Kinect) but couldn't imagine FaceID across their product line and Animoji. Regarding first party hardware, look what Amazon and Google did? They stole Apples Siri+Home idea and are more successful because they also prepared by developing their own hardware (which ironically spies on you). This is why I hate the "Apple shouldn't get into that business" excuse and trust 3rd parties to push their ideas. Sometimes 3rd parties don't give a sh** about your platform. Home security systems already sell subscriptions. You get emergency services and video sent to a center full of employees. Now if Apple can automate the process with more security and no employees. THAT would be the future. Imagine Siri sending you a video of someone in your house, asking if you allowed them in? Or warning you that someones been outside your home for 2 minutes peeking through your windows? On a less scary note Siri could tell you that your package has arrived at your front door.